Want to win a lens for Christmas? I'm going to run a quick contest featuring the Pentax 35mm as the prize, or another lens of similar value if you already have the 35mm (vintage lenses included). So what's this contest about? It's simple: design the best PentaxForums.com banner to win! 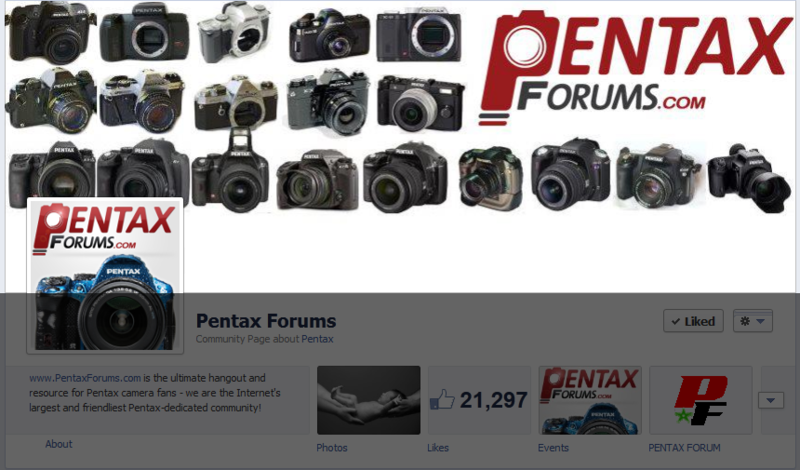 The PentaxForums.com Facebook page is in need of a new cover photo, and I thought why not let our members design it! The best submission will be used as the new Facebook cover photo (as determined by the site staff), as the author of this submission will win the lens! Note: if you end up not using the logo or placing it elsewhere, your submission may still be accepted if it is otherwise very appealing. You will be notified via e-mail if your banner is rejected. 6. Strong recommendation, but not a requirement: include photos of Pentax gear in the banner! You will receive a reply confirming your submission was successful. This contest closes on December 20th, so that we can get your lens delivered to you on the 24th, in time for Christmas! Non-US members: allow up to 2 weeks for delivery, subject to customs fees. Note regarding the prize: if you already have the DA 35mm lens, we will be able to get you any vintage lens listed on ebay, our marketplace, Adorama, or B&H, up to $150 in value. Prize will not be issued as cash or a gift card, terms subject to change at any time. By entering this contest you agree to allow us to use your submission as our facebook banner at any time. This is a really cool idea for a contest! I'll have to see what I can whip up. only png or psd ? Can I send SVG file instead PSD ? If not, I'll send exported PNG file - that's no problem. SVG is fine as it's not a compressed format, and larger files are fine also, as long as they conform to the aforementioned aspect ratio when scaled down. How are you going to store our logo in SVG, though- would that require it to be traced and converted into a path, or do you plan on pasting it in afterwards? Just curious as to why the logo has to stay on the right hand side ? Another question: is it one submission per member or can we submit more than one idea? Last edited by VTerlakyPhoto; 12-14-2012 at 05:49 AM. Hi, does this mean that I can use pictures from Global Site | PENTAX RICOH IMAGING ? Sweet...the 35mm and the DA* 16-50? I'm on it. Great!! I will work in on the weekend!!! All times are GMT -7. The time now is 07:18 AM. | See also: NikonForums.com, CanonForums.com part of our network of photo forums!